Eat. Drink. Sweat. Repeat. Click here to read about the ultimate 'Dare To Bare NYC' experience. WHAT'S THE DIFFERENCE BETWEEN VIP AND GENERAL ADMISSION (FOR SOULCYCLE REGISTRATION)? DO I SELECT MY BIKE FOR THE SOULCYCLE CLASS? There's no bad seat in the house when you're tapping it back in the middle of Union Square Park with your favorite SoulCycle instructors, but priority seating is given to those who are active in their fundraising efforts. You'll receive your bike assignments when you check in at the door on Sunday, October 1st! I'm signed up for a SoulCycle class. Do I need to fundraise? Yes. You are required to fundraise in order to ride. 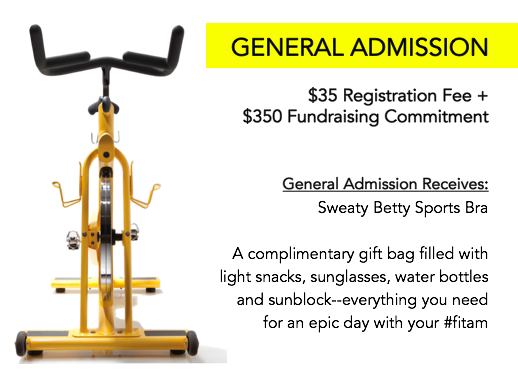 Our SoulCycle classes require both a registration fee and a fundraising commitment of either $350 for General Admission to $2,000 for VIP Admission to participate. I would like to register for SoulCycle, Yoga and Barre. Do I have to purchase a ticket for each class? Yes. Each class requires registration and payment in order to participate. Each dollar earned through registration goes to the development of life-changing health and fitness programs for young girls across the country. WHAT DO I GET WHEN I REGISTER FOR A PAID FITNESS CLASS? Thanks to the generosity of London's leading premium women's activewear brand, Sweaty Betty, each paid registrant receives a 'Dare To Bare' branded Sweaty Betty Infinity Workout Sports Bra (value of $65; limit one per person, even if registering for multiple classes) to wear to the event. You'll also receive a complimentary gift bag filled with everything you need, from snacks and sunglasses to water and more, for a memorable day working out with your #fitfam. Sweaty Betty will be offering the Infinity Bra in ultramarine blue with a limited edition print of the Power Leggings for VIP participants. WHEN CAN I GET MY SPORTS BRA? Can't get to packet pick up? It's preferred that you grab your sports bra early to get comfortable. But for those who can't, you can also get it on the day of the event. Changing rooms will be provided for your convenience. WHAT DO I GET WHEN I REGISTER FOR A *FREE* 305 FITNESS DANCE CARDIO CLASS? Are you a Green Event? ARE YOU A FAMILY FRIENDLY EVENT? Kids are free with any ticketed adult and we'll have tons of activities just for them, from an all-ages dance class to photo booths, live dance performances and more. Spectators are welcome to watch and absorb the mission and energy of the event — so bring your husband, mom, sister or friend to cheer you on from the sidelines! WHERE iS THE EVENT AND WHERE CAN I PARK? 'Dare To Bare NYC' is held at Union Square Park, Broadway To 4 Ave., E 14 St. To E 17 St. (the northern side of the park opposite the Barnes and Noble.) Doors open at 10:00 am with classes starting promptly at 10:30 am so please arrive promptly! Doors open at 10 am, with our first set of classes all starting promptly at 10:30 am. We recommend arriving 20 - 30 minutes early to check in with ease, as we'll need to provide you with wristbands to get you on your way! Once you have arrived to the venue, please make your way to the Event Registration Check-In Tent. SoulCycle Riders: At check-in, you’ll receive your bike assignments, shoe rentals and your event access wristband. Fitness Class Participants: At check-in, you’ll receive your class access wristband then you’re free to begin exploring our festival zone and sponsor booths. WHAT DO YOU RECOMMEND FOR FOOD AND DRINK? As with any fitness class, you want to stay well-hydrated and well-fed. It’s advisable that you eat a light snack 30 minutes before your workout and have a snack afterwards to refuel those muscles! For SoulCycle riders at the VIP level, you’ll be provided with pre-ride snacks and a light lunch for after you rock that bike.